In the first post in this series on how to read in a foreign language we saw how important reading is even if your main aim is to speak a language well. You’ll make better progress if you realise that reading is not one skill. Think in terms of four different types of reading, each with a specific purpose. Let’s unpick the four together. If you skim a text, you’re reading for gist. Your aim may be to get a sense of how a text is structured, what it is broadly about, its main themes and ideas. You’re aim is to decide whether the material is worth your closer attention. Are there particular bits you want to focus in on or do you want to put it aside as not relevant or interesting? You might skim read a long magazine article or a page of holiday ads in a newspaper to see whether any are for a place you want to go to. Skimming is what’s called “top down” reading. That’s to say, you’re working from the general to the specific. The popular conception of reading is the “building block” approach: you work out individual letters, then words, then sentences, until you have the meaning of a complex text. That’s the sort of struggle we remember from our days as small children learning to read, an outstretched finger moving from word to word. It turns out that as proficient readers in our native tongue, we don’t actually read that way. It would just be too slow. Rather, we bring a lot of general cultural knowledge and specific expectations in relation to the subject of the text. That’s at the “macro level”. At the “micro level” of processing the marks on the page, our eyes don’t focus on individual letters or even words. They take in chunks of text. I cnduo’t bvleiee taht I culod aulaclty uesdtannrd waht I was rdnaieg. Unisg the icndeblire pweor of the hmuan mnid, aocdcrnig to rseecrah, it dseno’t mttaer in waht oderr the lterets in a wrod are, the olny irpoamtnt tihng is taht the frsit and lsat ltteer be in the rhgit pclae. The rset can be a taotl mses and you can sitll raed it whoutit a pboerlm. Tihs is bucseae the huamn mnid deos not raed ervey ltteer by istlef, but the wrod as a wlohe. Aaznmig, huh? Yaeh and I awlyas tghhuot slelinpg was ipmorantt! Now, this party trick may work far better in English than it does in a language like Russian, where case endings are so important. It might not work for agglutinative languages like Turkish, where one word can contain may blocks of grammar or for languages like Hebrew where the vowels are not written. Still, a more general truth holds: at the level of individual words, context matters. The closest analogy appears to be the “predictive text” model from computing, with the brain filling in predictable gaps. To get to be able to do that in your new language, you must have the top-down skills. At macro level: know the culture, know the context. At the micro level: you’re aiming one day to know the structures of the language without thinking. You certainly can get there, but it takes a lot of exposure to the language and practice. So a key is to keep getting that exposure without becoming demoralised and giving up. For that – as we’ll see – you need the right attitude and the right, “graded” reading matter. Besides skimming, there are three other ways of reading that you need to practise in your target language. When you scan a text, you are on the lookout for specific info. Like skimming, scanning is very “top down”. You might be checking a timetable to find out when your train leaves. You might be scrolling down the contributions on a discussion site for an original view on your favourite TV show. When you scan, the rest of the text is really of no relevance at all. You just don’t care about the time of trains to other destinations or yet more hackneyed views on that TV slow. Intensive reading is the way you (or more likely your poor lawyer) might read a new contract before you sign it. This is the way you might read a set of instructions for assembling a new piece of equipment (unless you’re one of those people who ignores the instructions and just dives in and works it out by trial and error). When you’re reading intensively, it’s likely to be appropriate to reach for the dictionary if key words come up that you don’t understand. While it’s always informed by a lot of “top down” context, “intensive” reading is the type where you do have to go “bottom up” more often. Extensive reading, as the name suggests, is, erm, voluminous in scale. Pages upon pages, for pleasure. We’d read a novel in our native language this way. We are reading for sense, but it’s for the flow of the narrative, atmosphere, character, action. The bulk of the details (and words) are probably not so important in the grand scheme of things. It’s back to “top down”, most of the time. You’ll find that a good coursebook will practise all four skills. Typical learners, however, all to often forget the different ways of reading. Faced with a text in your target language, do you start plodding word for word, getting stuck and downhearted every time they hit something they don’t understand? Do you again feel just like that small child in its first language….or somebody doing intensive reading of that legal contract? If you’re trying to read a text intensively when it’s not that kind of text, chances are that you’ll get very frustrated. Are you expecting it all to feel like extensive reading in your mother tongue? In the early stages, your attempts to pull apart the first, simplest dialogues or other texts in your coursebook will mainly be a kind of intensive reading. If you’re into the mechanics of languages and are intrigued by intricacy for own sake, you may find the process fascinating. But you may find it frustrating, especially if you just want to be able to “get around” in the field in your target language. You want to be able to scan those timetables and skim those ads. You also maybe want to get stuck into literature in your new language and are aiming to become a comfortable “extensive” reader as soon as possible. For successful scanning, skimming and extensive reading you need to have the right attitude, from the very beginning. faced with a text, ask yourself “why am I reading this”? Which of scanning, skimming, intensive or extensive reading the most appropriate? As proficient readers of our native tongue, we ask ourselves this question without even realising it. Yet when we’re learning a new language, we tend to throw our experience out of the window. It’s as if we’re small children again, pausing over every word and making a real meal out of the task. use “intercomprehension” skills wherever you can. That’s to say, use your knowledge of languages closely related to your target (and “international” words) to make intelligent guesses at meaning. remember, what you are trying to do is get meaning from the text. For that, you don’t always have to understand everything. Become comfortable with gaps in your understanding. You should be well-placed to give skimming and scanning a go quite early on. You just need to know the vocab around key information you’re looking for. You’ll find that you can take something useful away, even if you don’t understand all the surrounding vocab and grammar. The problem with extensive or intensive reading as an elementary or intermediate learner is that your vocabulary is limited. Your knowledge of structures is incomplete. You risk drowning in a sea of words. There’s no point launching into an “extensive” read of War and Peace two weeks into your Russian studies if you understand only a fraction of the vocabulary. If you’re ignorant of half the grammatical structures you can’t do an intensive analysis of a page or two either, even with a dictionary. 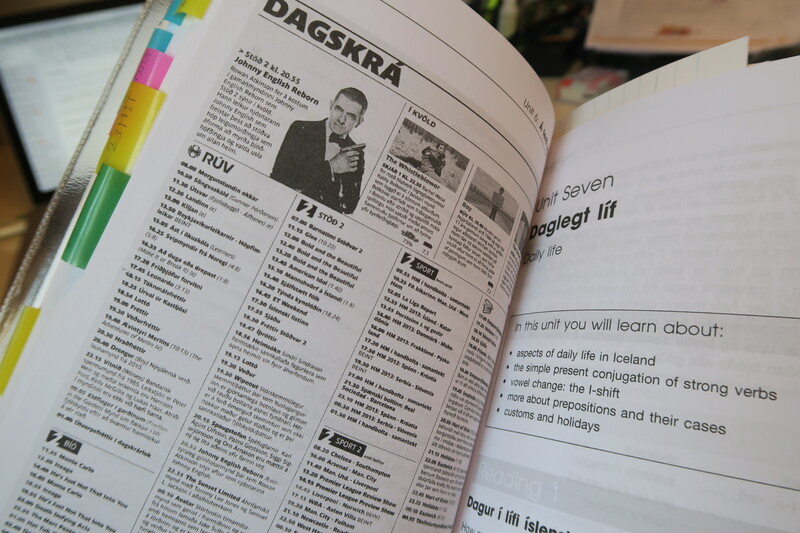 The best way to deal with this at a beginner or lower intermediate learner level is to focus on the reading materials in your textbook (assuming you have a good one). Those materials will be carefully “graded” to your level. If you’re hungry for more, you can supplement the material in your textbook with other similarly “graded” texts which are aimed specifically at learners of your level. In the next post in this series, we’ll come back to the use of graded texts and look at other specific tips to spice up your approach to reading in your foreign language. It’s worth the attention. After all, reading is one of the main means by which you’ll get fluent. It’s also one of the main reasons you’d want to. Hi! Salam hangat dari Indonesia. This is a great advice. I agree with your thought about reading technique for learning foreign language.